Fans of Crystal Pepsi have waited 20 years for this moment. The crystal-clear soft drink isn't headed back to stores -- at least not yet. But PepsiCo (PEP) announced a contest Tuesday that will award a few devoted fans a six-pack of the famously transparent soda. The contest, which will take place on Dec. 10 and 11 via the Pepsi Pass app, will award 13,000 six-packs of 16-oz. bottles to 13,000 winners. Crystal Pepsi debuted in 1992 but was pulled off the market in early 1994. Despite that short shelf-life, the 90's soda has maintained a loyal following, which has campaigned for years to get Pepsi to bring it back. Pepsi won't say whether the sweepstakes is a prelude to the soda's more permanent return. PepsiCo is bringing back Crystal Pepsi, but it's limited to 13,000 six-packs. 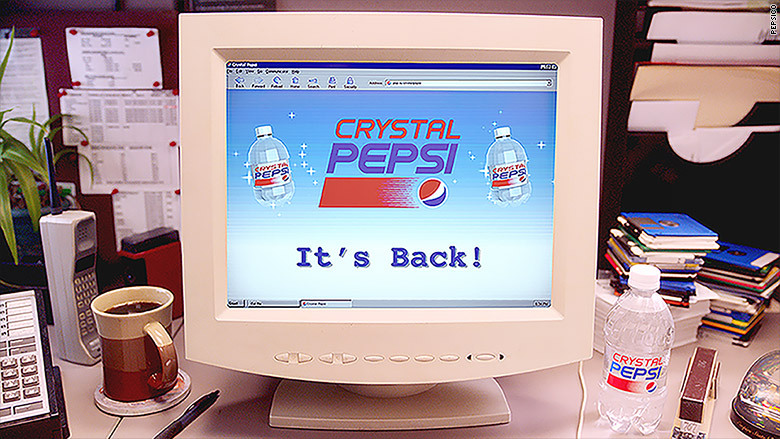 "We have a lot of fans and they're really enthusiastic and they've been asking for Crystal to come back for a long time," said Linda Lagos, marketing director for the Pepsi brand. "We thought it would be special to bring a holiday treat to our fans."